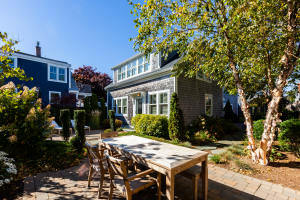 « Provincetown – Studs To Shingles – Before And After. Published on February 5, 2019 in general info. Closed Tags: Cape Cod luxury sales, Cape Cod new construction, Cape cod real estate sales, Provincetown luxury homes, Provincetown new construction, Provincetown real estate. 2 Baker Avenue is a charming single family home with two bedrooms and two baths with 1,752 square feet. It was marketed for $1,425M and sold for $1.425M. Baker Avenue is a hidden gem of a lane in the near East End off of Pearl Street. MLS REMARKS: Tucked away on charming Baker Ave. is this beautifully renovated home. Set on a good sized lot in the heart of town, the irrigated grounds are beautifully landscaped with handsome stone-work & brick walkways that lead you to different outdoor ”rooms”. One for dining, one for lounging & one set under a pergola. The house was fully renovated from top to bottom in 2013. The first floor has gorgeous reclaimed pine floors throughout. The spacious living/dining area with a gas fireplace & built-ins, leads to a wonderful cook’s kitchen. The quartz island with ”waterfall” ends, is a great work-space open to the living area. A laundry room, a den & full bath complete the first level. Upstairs, is a guest bedroom with beamed cathedral ceiling as well as the master with ensuite bath. The master bedroom is huge and runs the entire width of the house. There are sweet views of the rooftops and bay in the distance. Parking for at least 3 cars.